Well, the title says it all! After deciding to go the home brew route, John was faced with solving engineering challenges at every turn; from selecting materials to the finding of specialist connectors and attaching mechanisms. 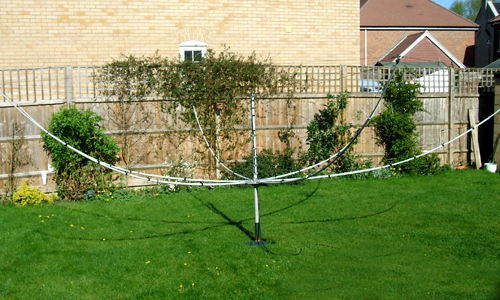 Before building the beam, however, John wanted to move his mast away from the house and the possible overhang of the newly fitted solar panels. Of course, the original mast was mounted in a large block of concrete which needed to be broken up to release the mast mounting post. The lifting of the post was done with the help of a hydraulic jack. Those familiar with the look of the hex beam will know it looks a bit like a satellite dish facing upward. John started with extendable fishing poles but found they didn’t have the right amount of bend. Glass fibre poles did the job, and were used. Next was the choice of wire to make the elements. John tried several types and settled on flexweave. Measurements confirmed low SWR for almost all bands, but a little adjustments brought all within useable range with good front to back and forward gain. John said this was a real ‘labour of love’ and with the help of friends, specially Ian, G3ORG the beam is now up and working well.